Why are grandmothers so important? Many grandmothers shoulder the burden of looking after orphans and other needy children when their parents die of HIV and AIDS at a very young age. Robbed of income earners with no one to help they depend on growing vegetables for food. No retirement packages, no health insurance and no access to basic needs of life due to a lack of money. As a result of all these challenges they lose hope besides the traumatic experiences faced as a result of the death of their very own children. NIRP has helped grandmothers to restore their hope and energy to care and support orphaned children. Orphans are given school fees, scholastic materials, medical care and other material support to nurture their full potential to adulthood. We support grandmothers with house construction, materials, social support, food, beddings, water tanks, counselling and provide income generating activities to enable them to support the orphans. Grandmothers have been organised into solidarity groups in order to share ideas to find solutions to the challenges they face. Strong groups have been linked to other civil society organisations and government institutions to access support to enable them to care for the overwhelming number of orphans. 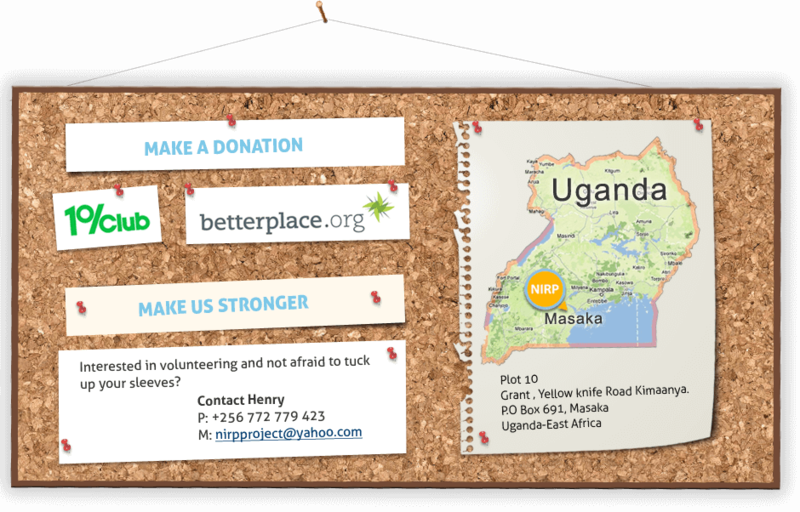 You can also contribute to support grandmothers affected by HIV and AIDS in Uganda. Make a difference today!